Pyrethrum refers to several flowers in the genus Chrysanthemum. The name is most commonly used to refer to Chrysanthemum cinerariifolium and Chrysanthemum coccineum. Pyrethrum are a natural insect repellant and are grown in vegetable gardens and landscapes to keep insects away from other plants. They are from mountainous regions and like to grow on sunny, rocky slopes. Pyrethrums look very like daisies. The Dalmation Chrysanthemym looks the most like a daisy with white petals and a yellow center. The Persian Chrysanthemum looks like a daisy as well but can have white, pink, or red petals with a yellow center. While pyrethrums can be planted from seed, they are most often propagated through transplants. These flowers are hardy from zones 3 to 7. They are planted in the spring after all danger of frost has past. Pyrethrums require rich, well drained soil to grow well. They require extra phosphorous to thrive. Pyrethrums prefer soil with a minimum pH of 5.4 to slightly alkaline. Pyrethrums require watering every week. One inch of water delivered all at once is recommended to develop deep roots. Excessive watering will lead to root rot with these plants. Pyrethrums grow to 24-30 inches. They should be planted 12-18 inches apart. Pyrethrums prefer full sun. They will not grow well in the shade. They bloom in late spring, early summer and can continue to bloom all summer, depending on the amount of sunlight they receive. The first year the plants do not produce as many blooms as they do in the second and subsequent years. Blooms taper off after the fifth year so the plants should be replaced at that age. There are many varieties of Pyrethrum to grow. The two most common are Chrysanthemym cinerarifolium and Chrysanthemym coccineum. C. cinerarifolium is from the region of the Balkans called Damatia. Because of this it is sometimes referred to as the Dalmation Chrysanthemym. It looks more like a daisy than most members of the pyrethrum species. The white petals and yellow middle contain pyrethrum, a natural insecticide. 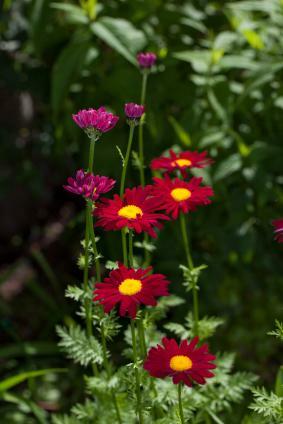 Because of that, it is often grown for the flowers, which are dried and then crushed to remove the pyrethrum from them. The major producer of pyrethrum is Tasmania, Australia at present. Kenya, Tanzania, and Ecuador also produce significant amounts of the plant. C. coccineum is a perennial plant that also contains pyrethrum, but is a poor source compared to C. cinerarifolium. C. coccineum is native to the Caucasus. It is referred to as the Persian Chrysanthemum. 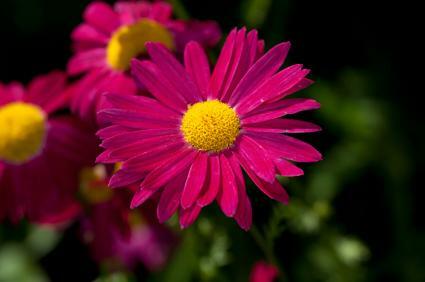 This plant also looks similar to a daisy but can have white, pink, or red flowers. It is grown primarily as an ornamental plant. Pyrethrum are grown primarily to produce the pesticide pyrethrum. Home growers appreciate the ability of pyrethrums to repel insects from plants that are near them. Many people also grow this plant for its beauty. It makes a fine addition to any flower garden as a medium height plant. Pyrethrums are vulnerable to root rot if they are in a poorly drained area or receive excessive water. They are also prey to several insect pests, including thrips, flower thrips, green peach aphids, red spider mites, and nematodes. Feverfew (Pyrethrum Parthenium) - The golden-leaved variety of this plant (P. aureum or Golden Feather) is now the most common. There are several forms of this plant. One is called laciniatum, and is very distinct from the older kind. These are used in geometrical borders, where they have a bright effect. Their culture is simple. Feverfew is transplanted after all danger of frost is past. New plants should be raised every year, as after flowering the second year the old plants lose their neat compact growth. Turfing Daisy (Pyrethrum Tchichatchewi) - A Caucasian plant, turfing daisy is able to withstand dry weather on dry banks or slopes where few plants would grow. Turfing daisy is a dwarf creeper, quickly forming a carpet of green. The flowers have white rays and a yellow disc. Hungarian Daisy (Pyrethrum Uliginosum) - One of the finest of tall herbaceous plants, and forms tufts 5 to 7 feet in height. These are crowned by lax clusters of pure white flowers, each about twice the size of an Ox-eye Daisy. It is excellent for cutting, and its blossoms are produced late in autumn before the Chrysanthemums come in. It is a stately plant for a rich border, and thrives best in deep, moist, loamy soil. It may be naturalized in damp places. Division. Syn., P. serotinum. Hungary. Pyrethrums are daisy-like in appearance and come in white, pink, and red. These perrenials can be grown as a beautiful plant in their own right or for the pyrethrum they contain. Hardy from zones 3-7, these plants are transplanted in the spring and bloom all spring and summer. They bloom best their second and third year and need to be replaced by the time they are five years old.